Before coming to France for your studies, you need to apply for membership in the French social security citizen by signing up via the dedicated website etudiant-etranger.ameli.fr. Finally, if you are a foreign student, you will need to show a valid residence permit (“titre de séjour”). To check whether you have the permit you need, or to learn more about the residence permit application process, please contact the French consulate in your country of origin or refer to the information available on Campus France. Agreements may allow to submit other documentary evidence. Please refer to the chapter below entitled “Other documents for your registration as determined by your country of origin”. Keep the temporary social security number that has been automatically generated for you by the website, and print off your certificate of entitlement. If you have not been able to register online, please contact by phone at 36 46 (0.06 €/min toll + cost of the call). If necessary, you may be referred over to an English-speaking.helpline. If you are a family member of an international civil servant and covered as such by the health insurance scheme established by the international organization which your family member belongs to (e.g. the Union European social security scheme), you do not have to register on this website. If you are a citizen of Monaco, ask your local social security fund in Monaco a certificate to before you come to France as proof of membership in Monaco’s health insurance scheme. You do not need to register online on etudiant-etranger.ameli.fr: when you arrive in France, you will submit this certificate to the health professionnals and healthcare facilities you will go to. Austria, Belgium, Bulgaria, Croatia, Cyprus, the Czech Republic, Denmark, Estonia, Finland, France (metropolitan France, Guadeloupe, Martinique, French Guyana, and Reunion), Germany, Greece, Hungary, Iceland, Ireland, Italy, Latvia, Liechtenstein, Lithuania, Luxembourg, Malta, the Netherlands, Norway, Poland, Portugal (including the archipelagos of Madeira and the Azores), Romania, Spain (including the Balearic and Canary islands), Slovakia, Slovenia, Sweden, and the United Kingdom (England, Scotland, Wales, Northern Ireland, Gibraltar). You do not need a student visa in order to study in France. You are free to enter France however long you plan to stay or study there. However, you need to be covered by an insurance submitted by your country for your medical and maternity expenses, or to have enough financial resources to support yourself and your family who may come with you in France. or, failing that, a sworn statement of sufficient financial resources. Apply for your European health insurance card (EHIC) from local health insurance fund. If you have this card, you will not need to register for student social security coverage in France. You will need to apply for the card in your home country and it must be valid at least until the end of the academic year. If you do not have an EHIC, you can have a provisional replacement certificate issued. When you register online on etudiant-etranger.ameli.fr, you will need to submit a residence permit (“titre de séjour”). If you are enrolled in a Quebec university (and not enrolled in a French university) you may come under the agreement protocol between France and Quebec, making you eligible for coverage of your medical expenses in France. Before leaving Quebec, apply to your local health insurance fund there (RAMQ) for a SE 401-Q-106 form “Attestation d’affiliation à leur régime de sécurité sociale des participants aux échange entre établissements d’enseignement supérieur” (Certificate of membership in their social security scheme for students participating in an exchange between higher education institutes) and have it filled in by your university in Quebec. This form certifies that your medical expenses are covered by Quebec’s social security scheme. You are a student from Quebec covered by Quebec’s social security system and enrolled in a French institute of higher education. Before leaving Quebec, apply to your local health insurance fund (RAMQ) for a SE 401-Q-102 bis form “Attestation d’appartenance à un régime Québécois préalablement au depart pour la France” (Certificate of membership in a Quebec scheme prior to departure for France). This form certifies that your medical expenses are covered by RAMQ’s health insurance scheme while in France. Before coming to France, apply to your local health insurance fund for a SE 130-04 form entitled “Attestation de droit aux prestations en nature de l’assurance maladie maternité pendant un séjour sur le territoire de l’autre Etat” (Certificate of entitlement to health and maternity benefits in kind during a stay in the other State). 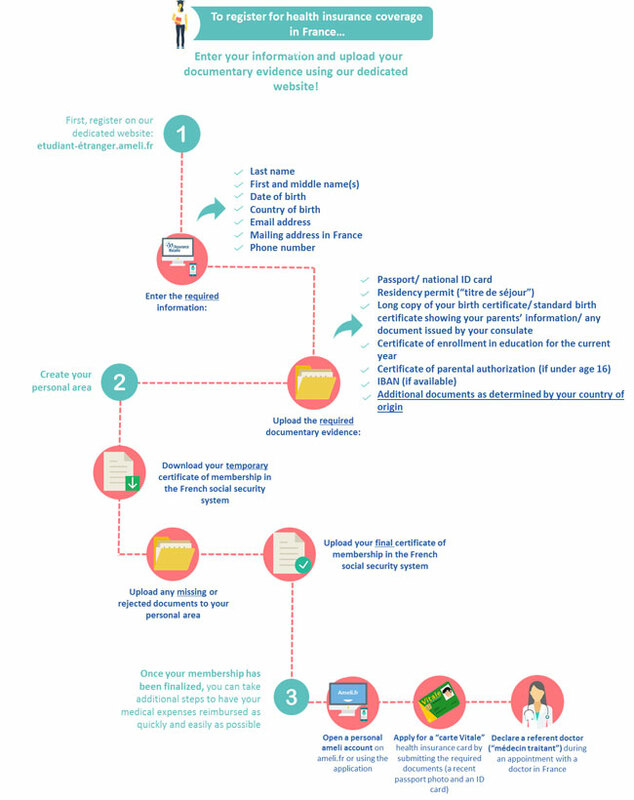 This form certifies that your healthcare expenses covered by Andorra’s social security system. You can also choose to join France’s social security system.